The Clean Energy Institute welcomed Mildred Dresselhaus (Professor of Physics and Electrical Engineering, Emerita and Institute Professor, Massachusetts Institute of Technology) on November 7, 2013 to present the inaugural CEI Interdisciplinary Seminar. 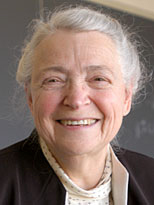 Professor Dresselhaus is a leader in the areas of carbon research and the electronic properties of materials; her series of experiments in magneto-optics led to a fundamental understanding of the electronic structure of semi-metals. Her most recent research is related to carbon nanotubes, bismuth nanowires and low dimensional thermoelectricity has attracted wide attention and she was recently awarded a Kavli Prize in Nanoscience in 2012. She is also the recipient of the National Medal of Science, the Enrico Fermi Award, 28 honorary doctorates, a fellow the American Academy of Arts and Sciences, American Physical Society (APS), IEEE, and the American Association for the Advancement of Science (AAAS), and a member of the U.S. National Academy of Sciences (NAS).